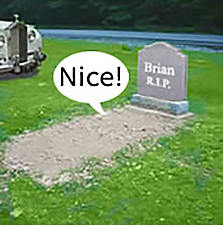 Budget coffins, The UK’s Top Coffin site! People are dying to get into our cardboard coffins. 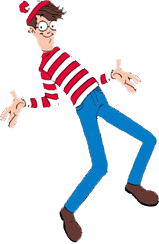 Why not pawn some of the deceased persons nicer items to finance a classic looking cardboard coffin. Prices start at only £100 up to around £300 including a 70 micron crem-film liner, many people say is a lot of money for a box, but they are constructed from 100% pure carton board. The natural brown finish looks very Eco friendly, which is a nice excuse to buy one, you can self decorate to give whatever finish you like. Rope or plastic handles are for decoration only at £30 extra per set. 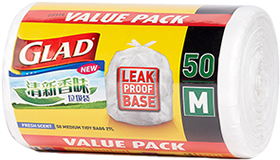 Not suitable for prolonged exposure to moisture, for example damp or rainy days, and not for keeping in our chapel fridge overnight due to condensation. 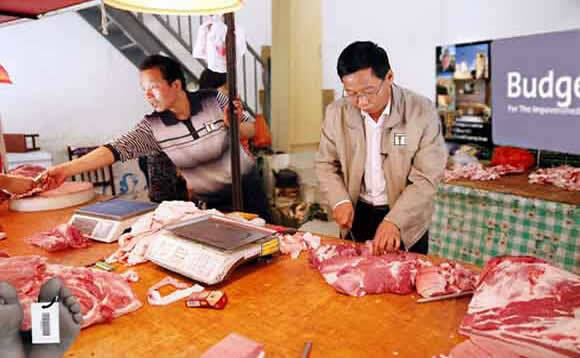 If the deceased was 14 stone or over a cardboard coffin will not be suitable, this highlights one of the financial advantages of dying from a wasting disease. 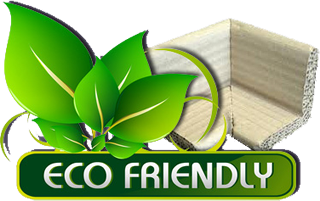 Although we like to believe our cardboard coffin is environmentally friendly this does not apply to fixtures and fittings including liners used for cremations, however what does biodegradable mean? We like to think it means after several thousand years of internment, and there is nobody about today available to double check this. 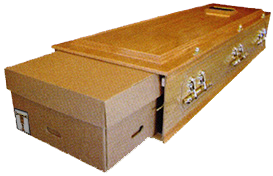 You don't need to splash out hundreds of pounds on a fake wood effect coffin, when for only £100 you can buy a Tenpasenta Eco-friendly Cardboard Box. Available in two luxurious shapes, Simple Box and from July 2017 the Traditional Shape at no extra cost. 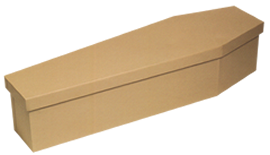 All of our cardboard box coffins come with the decease loved ones name hand written in permanent marker on the side or lid, this may be only for legal reasons but it does add a touch of class. Why not get all mourners at the funeral to sign the coffin and leave dull messages, just like when a birthday card is handed around at work for somebody you don't know, but without the £1 donation. Guaranteed to make any coffin look a bloody mess before burial or cremation. 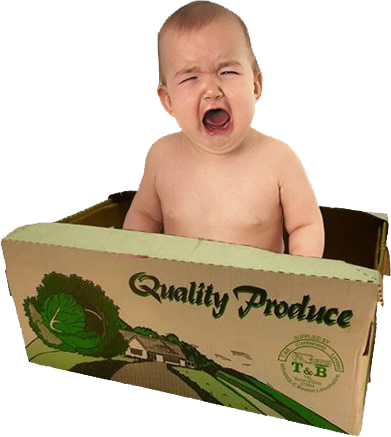 Please note that the Eco Cardboard Box is only really suitable for bodies up to 6'2'' in height, and certainly not for the overly obese! If misused these boxes will bend in the middle giving the pallbearers the appearance of rug delivery men. 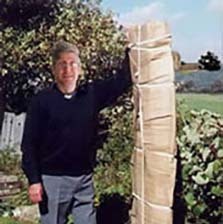 A genuine wood effect coffin cover can be hired for first half hour of the service, these are fairly good quality covers and give the impression that the funeral is not as cheap as it really is, £10 per half hour, so get your photos taken quick and your carrying done fast. 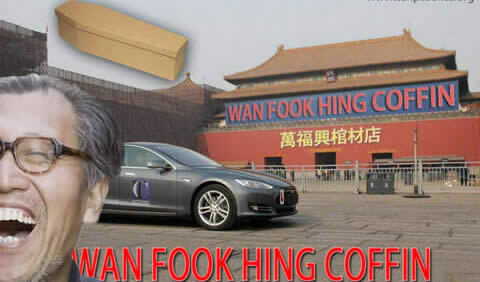 All of our coffins are hand built by craftsmen by one of our sister companies in China, Wan Fook Hing Coffin has be producing quality coffins since 1985, we distribute worldwide but have found the Western market most profitable. To the untrained eye these quality Budget cardboard coffins may look identical, but it's a funeral not Where's Wally, each coffin comes with the price tag in clear view, this will impress mourners in the same way you have to tell people how much you paid for jewellery, so the better the box you buy, the bigger the visible price. Why not have a unique medical waste look? 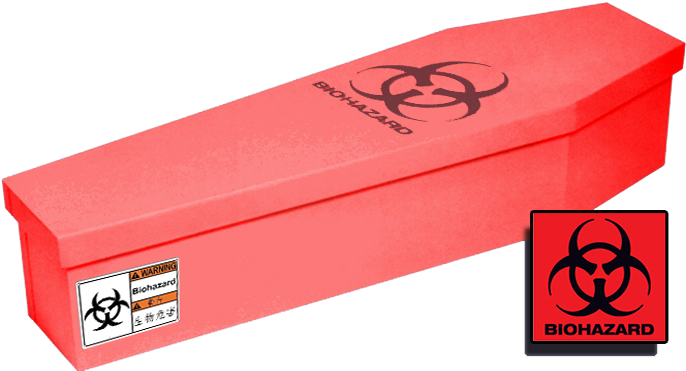 We offer the BioHazard print cardboard coffin in Red or Yellow. 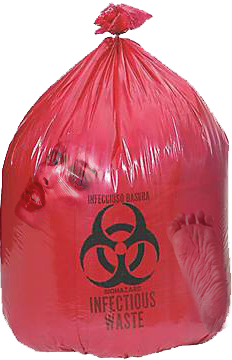 Or go for the BioHazard bag, great value at only £140! With old freezers clogging up scrap yards why not instead buy one to clog up our graveyard? Prices start at only £200 for one of the basic unbranded chest models. We have a selection of old Bosch and Smeg units available for the more choosy dead cheapskate starting at £400. 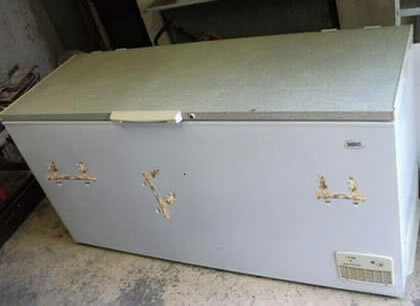 If you are having trouble funding your loved ones burial why not obtain a working freezer for you to keep them in at home until you've saved up enough money, if you did choose this don't tell anybody else, I expect there is some law against it. If you're investing in a quality cardboard coffin why not invest in some quality coffin sealer too, DUCT TAPE. 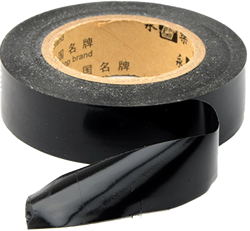 We offer a unique duct taping sealing service, prevent those odious odours leaking out, seal and strengthen, why not encase the whole coffin in the tape colour of your choice. Duct tape is pretty tough stuff, as far as we know a fully encased cardboard coffin could last forever. 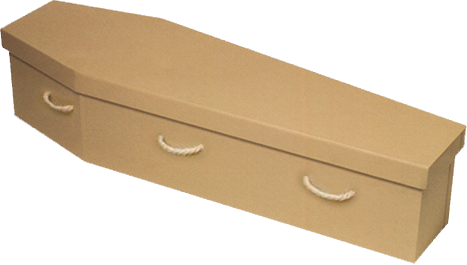 After seeing some of the beautifully printed cardboard coffins available these days we felt that our budget customers may feel left out, so we now let you design your very own creative coffin. 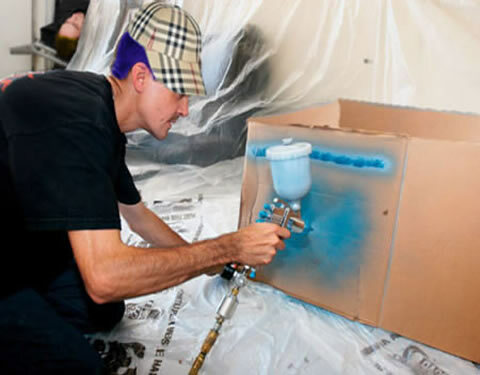 All of our cardboard coffin customers have the opportunity to use our professional paint spraying equipment and a choice of popular coloured automotive paints so that they can customise their loved ones dull looking cardboard coffin. 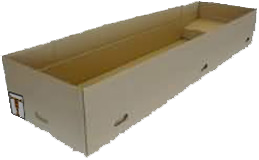 Custom paintwork should be completed at least 24 hours before before the body is placed in the coffin, our cheap cardboard does not stand up well to damp conditions and could lose its ability to withstand any weight or pressure put upon it. 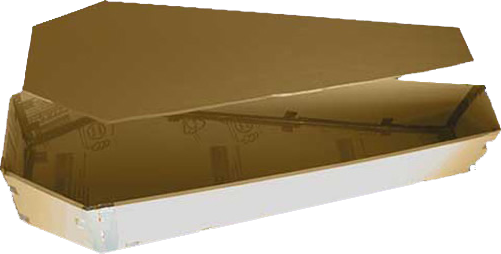 If poor weather is forecast for the funeral we recommend a thick layer of clear lacquer be applied for added protection. It has been noted that painted coffins burn very rapidly, so if you are having a pyre cremation the box may burn within seconds exposing the loved one in a manner that could scare mourners shitless. 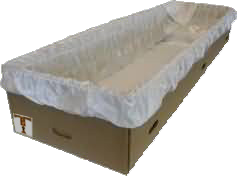 We have a wide range of stylish infant and child coffins, these budget coffins are the ideal choice for any family that has lost a young one but not lost the ability to watch their finances. 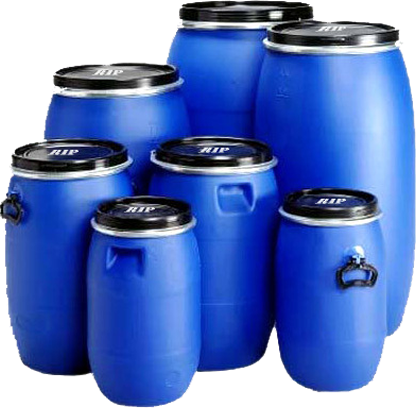 We sell many different sizes from our self storage sales office, prices start at only £20, but they can also be obtained free if you were to sneak behind the local Spar mini-market. 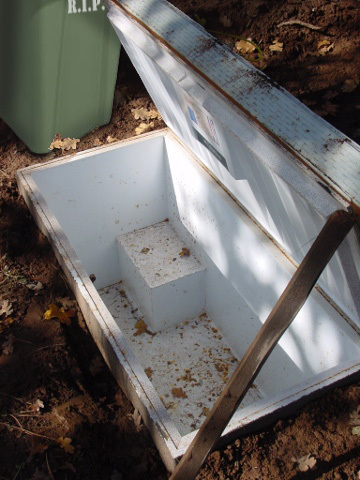 We suggest that the coffin be lined with a plastic bin bag before adding an old towel or blanket, a beautiful resting place for any child, living or dead. We can bury or cremate Budget children up to 12 years of age free of charge, which brings some cheer at this tragic time. *ANSWER: Chuck a few bones left over from a Chinese take-away spare ribs dinner into the pyre or with the infants cadaver, you can then take these charred remains home to show your friends and family or keep as a keepsake. For those still insisting on the Cardboard coffin for a taller body, we suggest that you take advantage of our tailoring service. 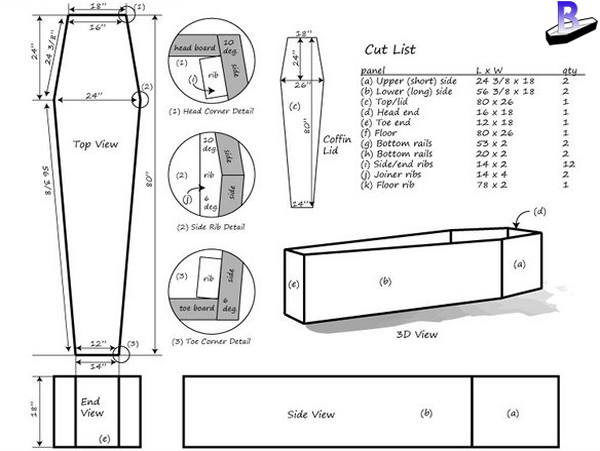 We can make height and weight adjustments to meet the coffins design specification, this is done by cutting off the loved ones feet, legs or even head, or we may cube the body (ideal for a suit case burial). Our friendly autopsy assistant Barry Collyer and his team are more than happy to make the required anatomical modifications, he says that cutting limbs sure beats running guts in the sink, we'll take his word on that. Ask about length adjustments when booking your budget funeral. We cannot guarantee our coffins will carry more than 14 stone, so heavier corpses may require 2 coffins, you have been warned. 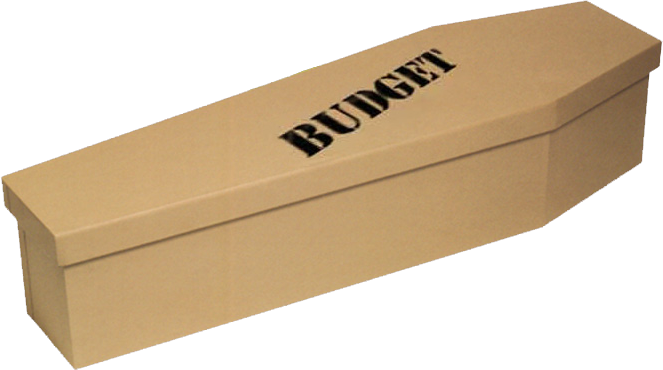 We have taken tips from our friends at Budget Funerals Mexico and are proud to introduce their budget coffin range into ours from 2018. Prices start at only £140. 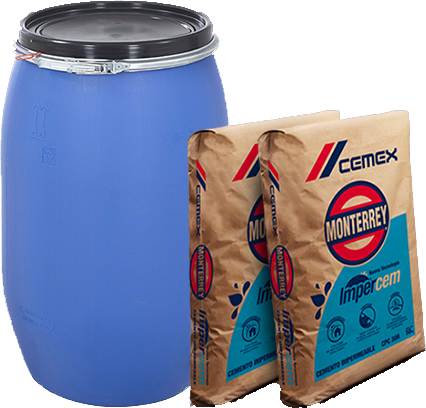 Cement preservative is an optional extra from only £15 per sack plus importing costs of £178. 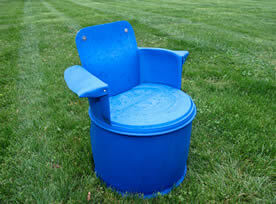 Ask about the all new Metal coffin The Oil Drum. 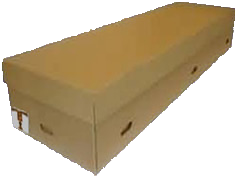 Benefit from our mixed pack in the event of a family tragedy with a set of 4 to 7 Mexican coffins from only £600! These beautiful coffins are also available in Portuguese, just ask any of our staff if they have a full Brazilian. 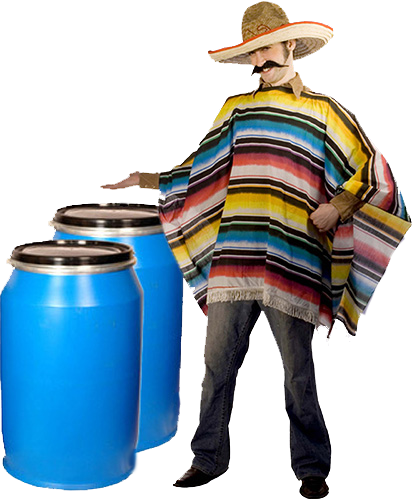 Budget Funerals recommends genuine imported Mexican Cement . 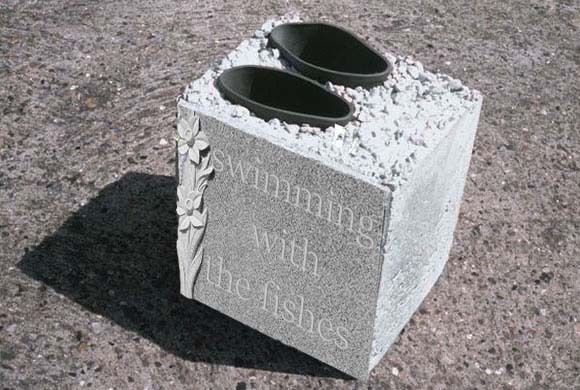 Why not have your loved one sleep with the fishes thanks to our Sicilian inspired cement shoes. This burial at sea in the Solent will require boat hire and a couple of strong men to handle the body on and off the deck. 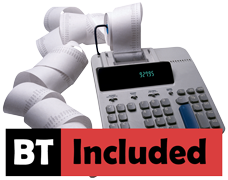 If your loved one is still living during the internment we will require a cash advance of a £2500 non-refundable deposit so that we can arrange an after dark departure from our boat yard, this is on top of our standard £1200 fee. Bring along your fishing rods for a free hour of sea fishing, £40 per extra hour required, free box of chips with every third hour booked! 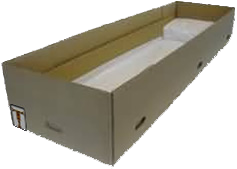 We recently purchased a vast amount of Japanese paper coffins as part of our deal with Matsushitty drive through chapels Corporation of Japan. 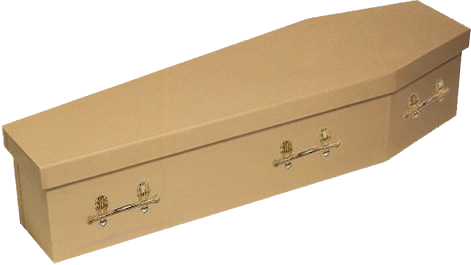 These high quality coffins are of a slightly smaller size than the average European ones. By a simple modification we like to call "ventilation holes", these coffins can fit very slim tall loved ones of either gender. 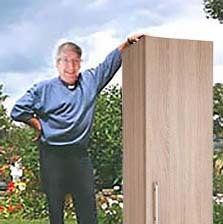 At only £350 we believe that these size friendly Jap coffins could be the future of cardboard coffins for the tall. 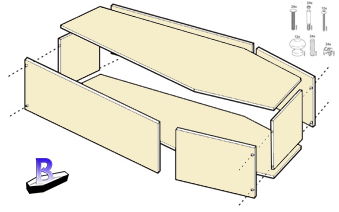 This is truly a quality coffin at a budget price, the holes are pre-drilled before being shipped to us, so any ideas of buying quality coffin on the cheap has been thought of. We have yet to find an easy solution for big fat bastards, but we're sure that North America will come up with an idea soon thanks to their obese population quickly filling their graveyards. 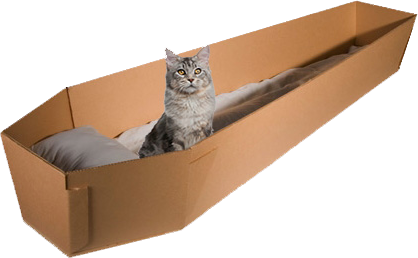 UPDATE: we now have XXL coffins available. It's a fact of modern life that many people are morbidly overweight, but there are many that are even bigger than this, unfortunately many of these big fat oafs die whilst still bleeding huge instead of waiting until they've slimmed down to fit into a reasonably sized coffin, this used to mean constructing very expensive bespoke coffins, but with so many big dead coming into our funeral shop daily we have introduced a new off the shelf American designed XXL model. Our beautiful new coffin is constructed from pine planks sourced from Sweden's premier timber yards and purchased from B&Q, it is pre-fitted with a standard pallet sourced from our local Spar making it easy to move by our elderly pall bearers, either by pallet truck or fork lift. 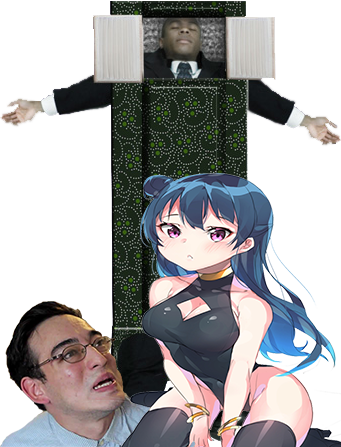 We have decided to call the XXL coffin The Slob, and the XXXL coffin The Big Fact Hunt. These are compatible with our pyres and for an extra fee our new jumbo sized Fat Furnace cremation unit. Be warned that a flow of hot fat running from the pyre is not unknown during the cremation of huge people. 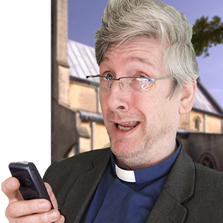 We asked Vicar Brian to demonstrate.